Harry Halon was in The A Sisters in the 1980's. Here they are in glorious VHS. Malcolm Bailey demonstrates how to make chicken pie. Brother and Sister, Sophie Colbourne and Andrew Howarth on their drive, inspiration and boxing achievements. Mr Alan Cross performing live at the Liverpool Hilton. A look back to earlier this year when between 20th & 22nd April, Liverpool was taken over by the Sea Odyssey Giant Spectacular performed by French street theatre company, Royal de Luxe. The amazing Billy Hatton talks about his time with The Fourmost during Liverpool’s Merseybeat days. Guitarist/vocalist Brian O’Hara and best friend guitarist/vocalist Joey Bower formed The Two Jays in 1957 and did a six week tour of the Isle of Man. The group changed its name to the Four Jays in September 1959 when bass guitarist/singer Billy Hatton and drummer Brian Redman joined the group. They made their debut at the Cavern Club on 1 March 1961, nearly three weeks before The Beatles. Rhythm guitarist/singer Mike Millward (ex-The Undertakers) joined the Four Jays in November 1961, followed by drummer/singer Dave Lovelady in September 1962. The band changed its name to The Fourmost in June 1962. On 30 June 1963, the group signed a management contract with Brian Epstein. This led to their being auditioned by George Martin and signed to EMI’s Parlophone record label. Find out more here. The Florence Institute had lain in ruins for three decades, but it is now on course to once again become a hub of the community after a painstaking £6.4m restoration programme lasting nearly two years. Ladies Day at Aintree is known as the biggest social and style day out in the North West. This episode features Matty Lyons and The Barbacoa in Crosby as well as music from Billy Strand. The charity Adventure Under Sail exists to further people's education through sail training. Here they are on a glorious day in Liverpool. The Reason Beer is More Expensive in Pubs. Why is beer so much more expensive in pubs than in the supermarket? Brian demonstrates how to make the best apple pie. Liverpool's namesake warship, HMS Liverpool, arrives in the city for her last visit to the city before she is de-commissioned. Filmed in Anfield a couple of years ago. This was a school set in the heart of the V Streets. What would you do with a Swan Pedalo? Dave Webster has been originating and producing sculpture, architectural mouldings and much more since 1960. The launch of Laura Belém's Temple of 1000 Bells. The Plaza Cyclists make it to London. The team set off today on their cycle trip London to raise money for the Plaza Community Cinema. Support them here. Sponsor the city 2 city cycle ride in aid of the Plaza Community Cinema here. 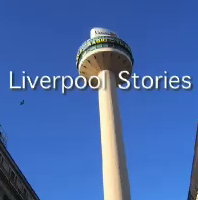 Some excellent examples of computer regenerated construction from Steve Wheeler, which forms part of a documentary film currently being made about the Liverpool Overhead Railway. More information can be here. Filmed for a small cinema in Widnes held over Easter. The School Desk Project - new ways to distort old graffiti from Nathan Jones. I was shocked to discover that the city council wants to demolish the houses around the Granby Triangle. It's a lovely area with a lot of potential. The residents around Cairns Street and the Granby triangle are fighting to hold their community together and stop the council's downgrading plans with initiatives such as holding a monthly street market where money raised is used to help beautify the street. Support them if you can from here. Two versions of the same poem by Nordahl Grieg performed beautifully by Grethe Borsum and Nathan Jones. Part of the NICE Festival in Liverpool. Following a spate of homophobic attacks in the city, Sunday 22nd November saw Liverpool's March Against Homophobia, which united people of all ages, sending out a clear message against homophobic hate crime. The Nordic Arts & Culture Festival returns to Liverpool from 19th November to 3rd December, showcasing contemporary Nordic Culture. Music: Motion Field - Ancient Science.